Conner’s Mom called me looking to book a fishing charter for inshore Miami. The two sixteen year old young men were on spring break from Buffalo, NY. Both of them have been on several flats fishing charters down in the Keys, but have never fished out of Miami. We met up that morning, keeping in touch with there mom during the fishing charter. We headed out to fish for some inshore tarpon, they hooked up on the first drift but lost a very large tarpon. I sent a text to his mom, but I think she did not believe me. So we got set up again and hooked up within five minutes, this tarpon ran us all around, but these guys are good anglers. They managed to get around all the sail boats and crab trap buoys. 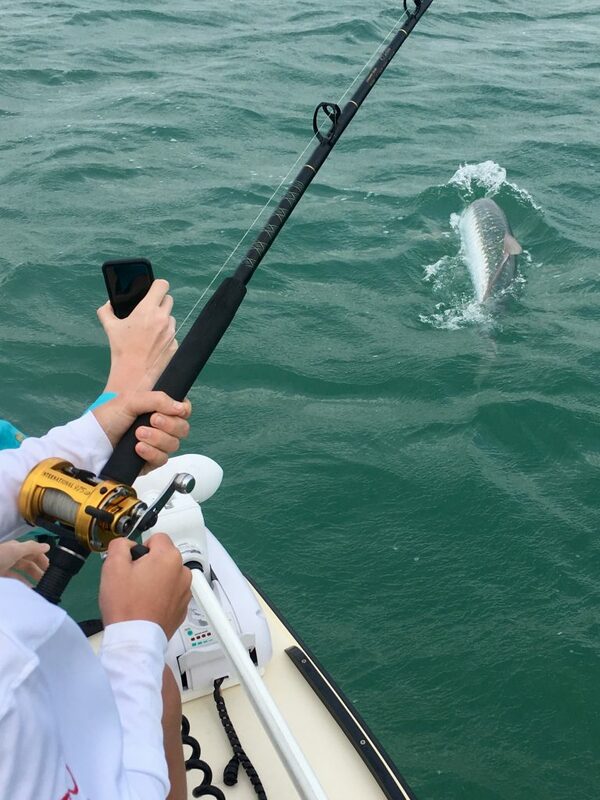 After about a 45 minute fight, I was able to leader the tarpon, weighing around 125 lbs. However, the tarpon was not ready. It took one last jump along boat side and instantly jumped, heading straight for the boats engine. The leader broke right at that point but it’s considered a caught fish – when the leader goes through the rod tip which it did! After that tarpon, we managed to hook another that pulled the hook on the first jump. We then decided to try for some black tip sharks in the flats of Biscayne bay. We caught several snappers, some jacks and blue runners, but did not see any sharks that day. Both were very impressed with how good the fishing was for them that day.